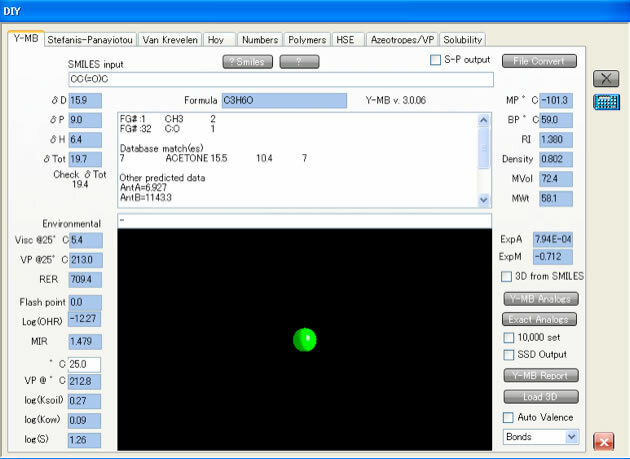 With HSPiP, you can enter molecular structure with smiles or MOL file. Smiles(Simplified Molecular Input Line Entry Syntax) is very popular notation. Please refer Daylight Home page what it is. There are several free or not free software. 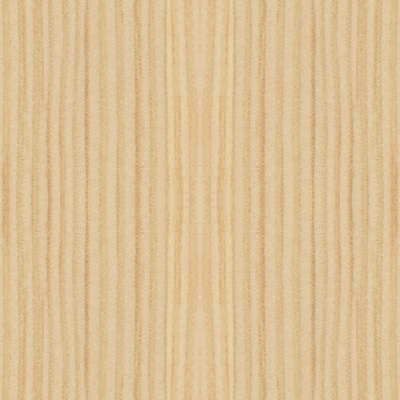 I recommend you "jchempaint". You can download this software by the net. I think latest version is ver. 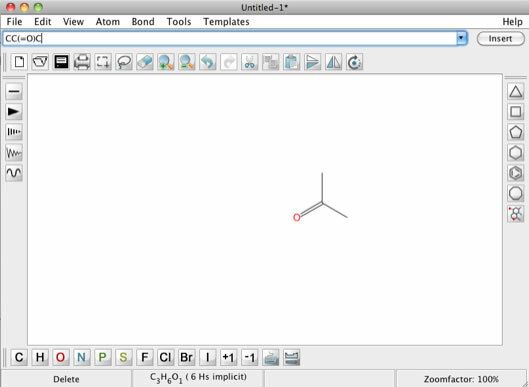 3.0.1.
jchempaint is JAVA program and run on Mac, Linux and windows, if JRE is running. 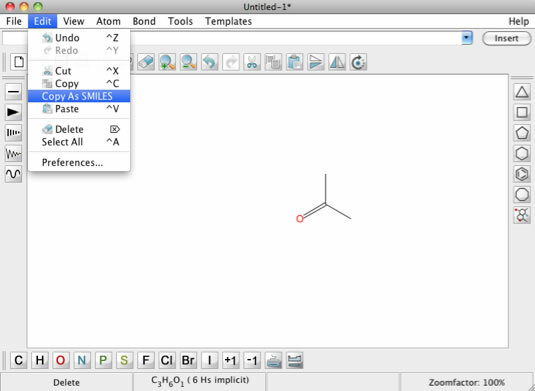 If you run this program, and enter Smiles at TextField then push insert button, then you will get 2D chemical structure. You can modify this structure as you like. After you draw molecule, you can get Smiles Edit/Copy as Smiles. And you can paste it to Excel or other text editor. You can handle molecule with line ASCII string, so it is very easy to handle. And run the HSPiP program and push sigma button, you will see the DIY panel. Paste the Smiles and push calculator button below X button on the right side. Y-MB analyze Smiles and divid molecule into functional groups. And Y-MB calculate several properties. 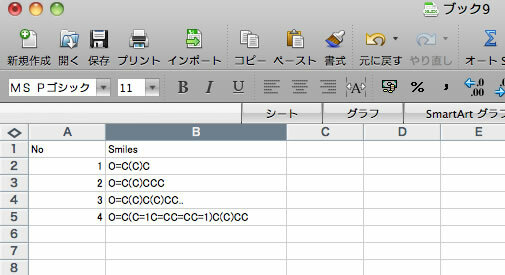 At this time, these calculation result is in the memory, so you can paste them into Excel directly. So, it is very easy to handle molecule with spread sheet. And Y-MB also search data base (10000) which has same functional groups same number. Above case, HCode(Hansen Code) is 7 Acetone, and official HSP value is [15.5, 10.4, 7]. Sometime, there are several candidates so this information will not copy. You need to copy manually. You can do all the things in one spread sheet, so it is very easy to work with HSP. (Notice: these picture is before release version. So it may differ slightly with final version)You can do with same thing for polymer. I expand smiles a little bit for polymer. You need to sandwich polymer repeat unit with dummy atom X. If you want to input ester polymer, you can not divid functional group with X.
JChemPaint does not support X atom, so you draw dummy atom by I(iode) and substitute on excel. Once, you get polymer-smiles then it same with original smiles in HSPiP. Y-MB divid polymer into functional groups for main chain and side chain. With this merit of polymer-smiles, like HSP database search, Y-MB search polymer database(1200) and show the candidate from it functional groups information. There are several candidates, but if you search polymer by name, it is very hard to get right name. 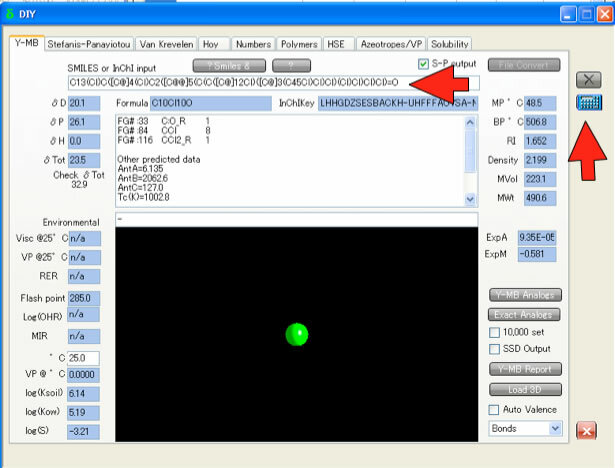 Pcode(Polymer code) search function is implemented into Draw2Smiles power tool in HSPiP ver.4. So, I believe this polymer-smiles is very useful for polymer chemists. For the co-polymer, I put every component in polymer-smiles. And put ratio information independently. Then I can search certain co-polymer with polymer-smiles. So, smiles notation is very important in HSPiP. If you have the smiles for chemicals, medicines, fragrances, cosmetics, polymers, then HSPiP will work very immediately.